Congratulations to Katie O'Laughlin '14, who was just named California Collegiate Athletic Association's women's soccer player of the week. 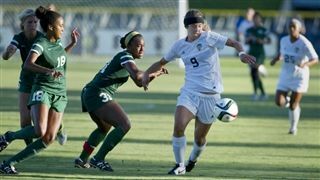 Katie, a striker for the University of California San Diego Tritons, launched her season with a hat trick in the team's 5-0 decisive opener against Azusa Pacific on September 1st. She followed that performance with an explosive first goal in the Triton's 2-0 win over Point Loma Nazarene on September 6th. Click herefor a quick interview with the former Firebird.